Gaming and dining join forces to craft a complete entertainment environment at The Painted Duck. Do not miss the duck nuggets, cooked duck meat shaped in rounds, panko crumbed and fried, to be dunked into a spicy ranch dressing dip, singularly good with Kentucky Nitro. The Painted Duck, Stockyards Atlanta, 978 Brady Ave. NW, Atlanta, GA 30318, 404-352-0048. With Meating Street Barbecue, Brian Keenan's locally famous barbecue has a home in Roswell. Although in theory dinner is served Thursday through Saturday, in reality, supplies often run out by 5 p.m., and when they do, he closes the place. Meating Street Barbecue, 1294 Alpharetta St., Roswell, GA 30075, 678-878-2006. Skillfully made dishes inspired by traditional Italian fare are served at A Mano ("by hand" in Italian). House-made pastas are plenty to share, and provide a glimpse of the kitchen's gift for blending seemingly disparate ingredients. A Mano, 587 Ralph McGill Blvd. NE, Atlanta, GA 30312, 404-549-7727. After a decade plus of success in Charlotte, N.C., its home turf, Bad Daddy's Burger Bar brings its skills to Atlanta. This clean, contemporary space offers lots of TVs for watching sports events, and a generous bar that invites conviviality along with booth and table seating. Among the burgers are the Bacon Cheeseburger on Steroids, which piles assorted bacons and bacon mayo along with other embellishments into a truly challenging two-hander. 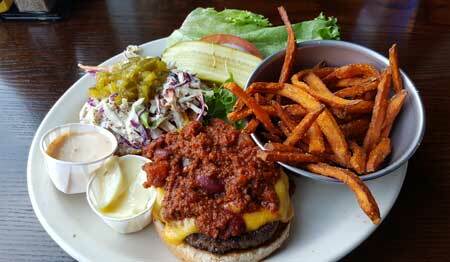 Bad Daddy's Burger Bar, Solis Parkview, 5070 Peachtree Blvd., Atlanta, GA 30341, 770-558-3217. Armed with a wicked sense of humor and serious culinary skills, Robert Phalen of One Eared Stag opened Mary Hoopa's House of Fried Chicken & Oysters. Mary Hoopa was his mother-in-law's nanny, and the recipe he uses for fried chicken is inspired by her methodology. Mary Hoopa's House of Fried Chicken & Oysters, Hosea + 2nd, 2371 Hosea L. Williams Dr. NE, Atlanta, GA 30317, 404-254-5326. ONE. midtown kitchen closed on March 4, 2018, after more than 15 years in business. ONE. midtown kitchen, 559 Dutch Valley Rd. NE, Atlanta, GA 30324, no phone.